In today's Blog Hijack, Sheri Sanders takes over to talk about Rock the Audition which will launch at Broadwaycon! Hey there! It's me, Sheri Sanders! You may or may not have heard of me, but I’m the Rock Chick. The girl who teaches people how to sing Pop/Rock music. The go-to-girl for Rock Auditions. I am hijacking this blog to talk about Auditioning for Rock Musicals and give you a few tips on picking the right song to sing for all the different styles of Pop/Rock Musicals that are out there! Here are a few important things for you to know! 1. One pop/rock song does not fit all styles. Hairspray is different than Hair, which is different than Sister Act which is different than American Idiot, Hamilton, and Amelie! 2. There are technically 8 styles of popular music currently represented on Broadway. 3. You don’t need eight songs. You need four. That's right. You should have four pop/rock songs in your book that cover ALL the styles. What do I mean? Check out this video of Pretty Girl Rock by Kerry Hilson. One song where she tipped her hat to EVERYONE in every era. Since there aren’t a lot of songs that do this in EVERY era represented on Broadway, let me share a few, and show you where to find them. 4. These are songs that I call “bendies”: songs that live in a few styles of popular music and could be “bent” to fit many styles. • Maybe by Janis Joplin (50s and 60s, 70s Folk/Rock, Country, Gospel, Blues. Curious about identifying others? I created a sheet music site where I made a deal wit Hal Leonard to cut and arrange thousands of popular tunes in all styles currently represented on Broadway. Now I scrolled down to Love on Top so you can see how I organized it. It tells you EXACTLY what time periods this song could be used for! You will find great songs, I have AWESOME taste. And if you wanna play with me, and learn HOW to bend your songs so they feel authentic in every era, go to www.rock-the-audition.com. There's tons of different ways to play with me no matter where you are on the planet! 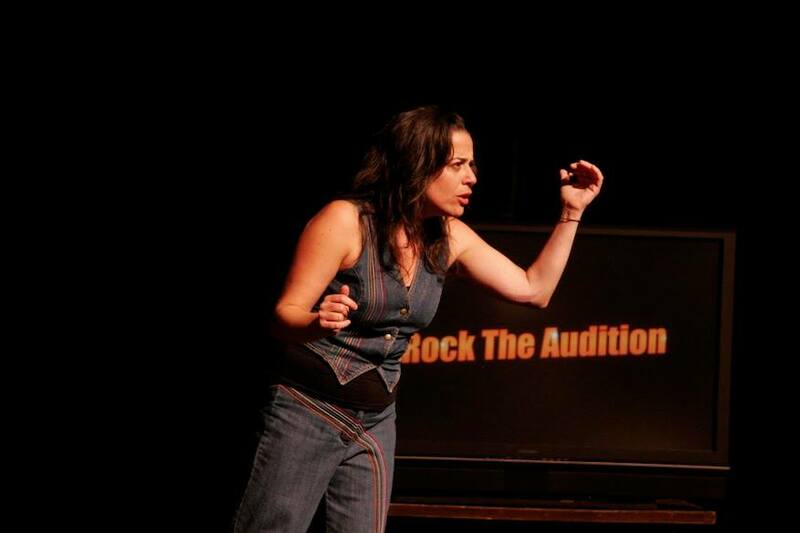 Sheri Sanders, celebrated performance coach, will be launching her new Rock the Audition - Pre-Professional Rock Musical Training Program, a collaboration with theatrical Buzzfeed phenom Theatre Nerds, at BroadwayCon on Saturday, January 28th at 3:00 PM. Sheri is a professional actor who in 2004, noticed that popular music was changing the landscape of musical theatre and created Rock The Audition: a master class in auditioning for rock musicals. The class became a hit in New York City and Sheri quickly became an international, preeminent popular music repertoire coach. Since 2011, Sheri became the first author to publish a book on the new relationship between popular music and musical theatre: Rock The Audition: How to Prepare for and Get Cast in Musicals. Together the book and master class have brought Sheri to 59 musical theatre programs in four and a half years. Sheri leads by example as a diversified performer as well, as Lourds Lane, the creator of the recent Off-Broadway hit Rock musical, Chix6, called her “the secret weapon” of the production, as Sheri successfully covered the entire company of rock singers - women AND men.